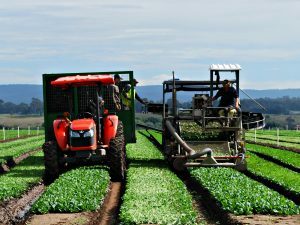 Many crops are still hand harvested, crops that may be picked more than once or crops that simply require the delicate accuracy of experienced field harvest crews. Our harvest crews often begin work in the early hours of the morning to ensure the product is processed before the heat of the day affects its quality. Baby leaf and baby spinach products are machine harvested. Bulmer farms have 3 small harvesters with a new Ramsay Highlander unit arriving in April 2015. This machine will greatly enhance our harvest efficiencies and product quality. Bulmer Farms have developed harvest practises that ensure the crops are returned to the Packhouse in the best condition possible, and when required our vacuum chiller draws heat out of the product prior to storage in our coolroom facilities.